Our Sunday Supper today is going to be with some friends at their home. We are sharing the job of making the food, so I volunteered to bring veggies and dessert. Since I have a full day scheduled I had to plan ahead and of course, I wanted to choose something that perhaps everyone hasn’t tried but that would very likely taste good to them. I chose to take advantage of sweet-tasting root vegetables that could be roasted (making them even sweeter) combined with some lovely quinoa. Quinoa is one of my favorite grains for a number of reasons. Number one, it has a germ that, when it is cooked, forms a ring around the grain. Like Saturn! Number two, quinoa is a very high protein grain and is therefore very sustaining. And three, quinoa is quick and easy to prepare. I roasted the veggies ahead of time so that late in the afternoon I could finish up the quinoa dish, finish another simple dish of kale, yellow squash and carrot salad with roasted crushed pumpkin seeds on top, and make one of my dark chocolate mousses. For the mousse I’m returning to the “March Madness Mousse” for its richness and because I’ve got all the ingredients. Wash the veggies and dice the carrots, parsnips, rutabaga and onions into 1/2-inch dice. Peel each clove in the garlic bulb and cut into similar diced size. Coat the diced veggies in olive oil and season them with salt, pepper, cumin and cardamom to taste. (I used about 2 teaspoons of cumin and about 1/2 teaspoon of cardomom.) Spread the seasoned veggies out onto a baking pan so they are in a single layer and put them into a 350 degree oven. Periodically mix them, turning the veggies so all sides get roasted. It takes about a half hour for these to be done at this temperature. Wash the quinoa in cold water. If you wish, you can quickly roast the quinoa in some olive oil or just dry roast them. 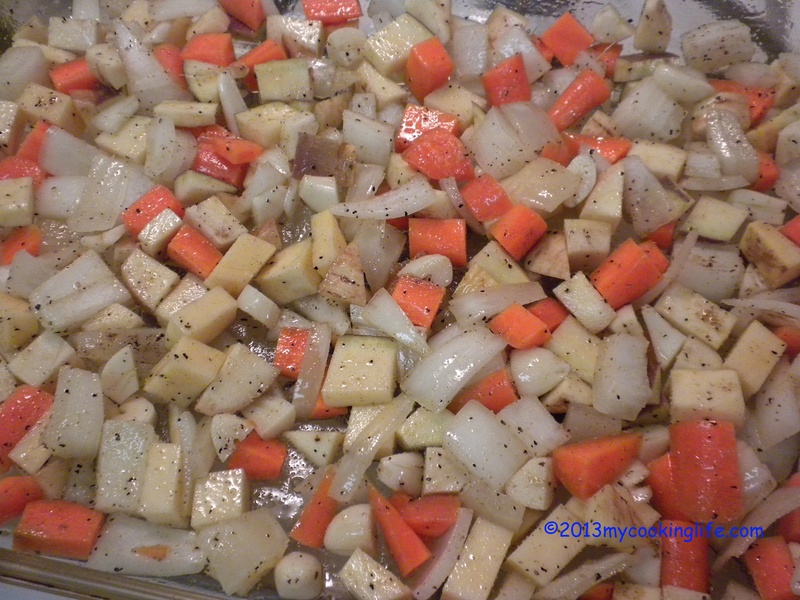 I opted for dry roasting because the veggies had plenty of oil already. I used a cast iron frying pan to lightly roast the washed qunioa. About 5 minutes. Cook the roasted quinoa with 2X water (give or take) and a two-finger pinch of sea salt. I ended up using 2 2/3 cups because I didn’t want the quinoa to be too wet since I was mixing it with the veggies as a salad. Bring the quinoa to a boil and then simmer for about 20 minutes. All of this can be done ahead of time. I don’t like to serve veggies that were refrigerated if I don’t have to. So I just left the roasted veggies out for the day until I got home. 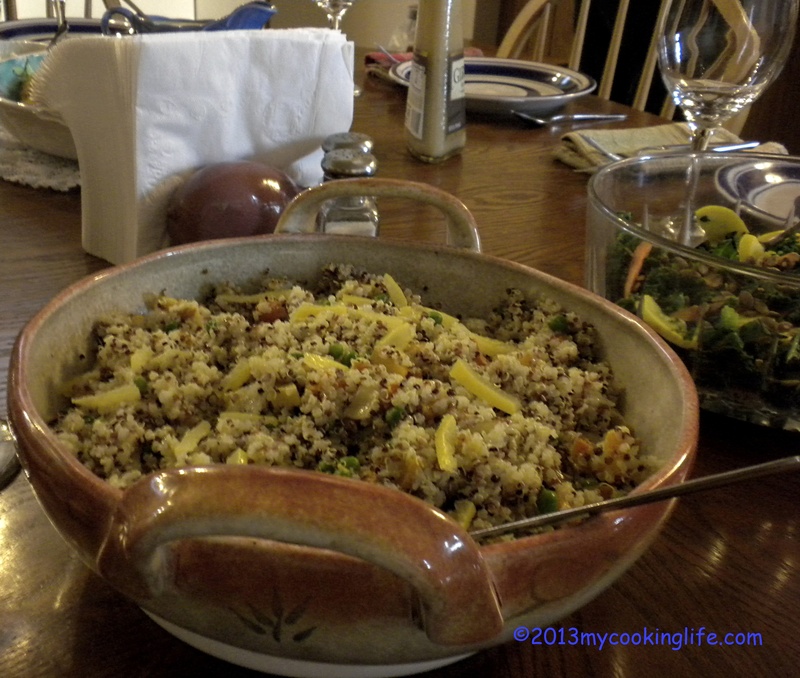 Then I combined the quinoa and roasted vegetables. I blanched some frozen peas and threw them in for color. I also slivered up some preserved lemon rinds. Find out what these are and how to make them here. If you don’t have them, try some fresh lemon zest! Dress the salad as desired. I simply used a little extra drizzle of olive oil and some freshly squeezed lemon juice. And what about the other diners? They all served themselves a generous portion and most had seconds! This entry was posted in Cooking, Recipes, Vegan and tagged Quinoa, roasted vegetables, root vegetables, sweet tasting vegetables, vegan cooking for people who eat standard American diet by mycookinglifebypatty. Bookmark the permalink. Great ideas! I have also eaten leftover quinoa softened up with a little coconut milk with roasted almonds on top for breakfast. Just the other day I came in possession of some quinoa and wasn’t entirely sure what to do with them. I was afraid it was going to be relegated to gathering-dust category in the cupboard but your post has excite me to cook it. Will absolutely make this – your recipe has so many ingredients that I love and I LOVE roasted veggies so it’s perfect. AndI have to see this Saturn-like ring around the grain that you mention! This is exciting! Definitely let me know how you like it.